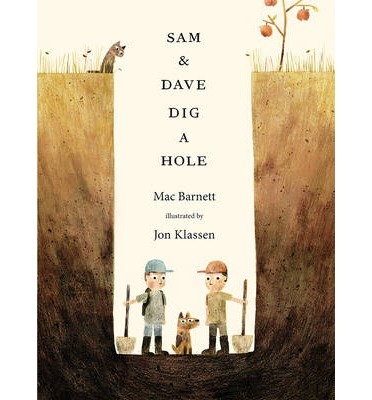 Sam and Dave are on a mission to find "something spectacular", so they start digging a hole. This book will leave children squealing with excitement and frustration as Sam and Dave come so close to finding something spectacular, but then change tactics in their search. Mac Barnett's simple, minimalist conversation between Sam and Dave combines beautifully with Jon Klassen's delightful illustrations to truly engage the reader and make them feel like a privileged observer througout the story. I love the open-ended conclusion to this book which challenges the reader and leaves them to think about what happened.... probably resulting in them flipping back to the start and reading it through again, studying the illustrations even more carefully the second time. It would be fun to hear all the different explanations the kid come up with! This book could be read in conjunction with a mathematics unit on directions. Students could blindfold each other and provide directional instructions to help a partner navigate their way to "something spectacular".